Milan day two was grey, rainy and miserable, but fortunately there was something to brighten it up this evening: a Prada show. And brighten up it did. The jaw-droppingly brilliant collection was full of acid neon colours, dinosaur, banana, and chimpanzee motifs and more than a few familiar faces. A Prada show always comes back to some deeper socio-political teaching. This time, the designer spoke of wanting to dress women “going out into the violence” – giving them a uniform to “go out into the street and not be afraid”. Here’s what went down. As we drove up the driveway towards the venue, a series of colourful neon lights began to emerge in the distance. Hoisted above the train tracks that run alongside the Fondazione Prada, they featured spiders, bananas, a flaming sandal from SS12 and a lot of Prada triangles. The signs were at perfect eye height to be seen from show space, which on the upper floors of a shiny, glass-fronted venue: the same one used for the recent menswear show. As we have come to expect with Prada, this show saw the return to the runway of some previous favourite faces thanks to casting agent Ashley Brokaw. First up was Liu Wen, followed by a 90s throwback in the form of Amber Valletta. 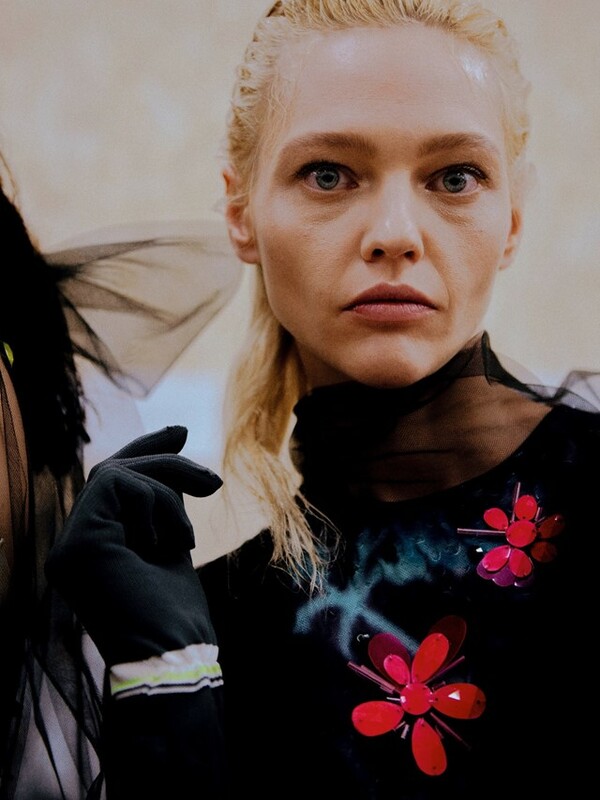 Then, ultimate Prada girl Sasha Pivovarova – who has starred in 13 campaigns over the years – returned to show everyone how it is done. She even posted some of her favourites on Instagram today – we shoulda known a catwalk cameo was coming, really. 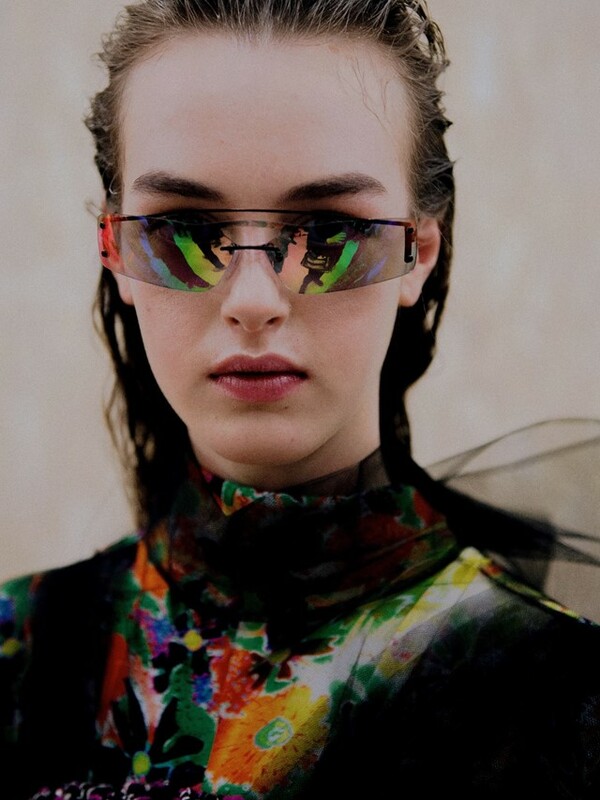 Prada were the trailblazers when it came to the tiny, 90s-style shades that are everywhere at the moment, and we’ll still be wearing them come AW18 if Miuccia has anything to do with it. This season, instead of the cat-like ones seen for SS18, they’ve been squared off at the edges and updated with a reflective, petrol-like coating. Crocs? Ugly sneakers? Next! 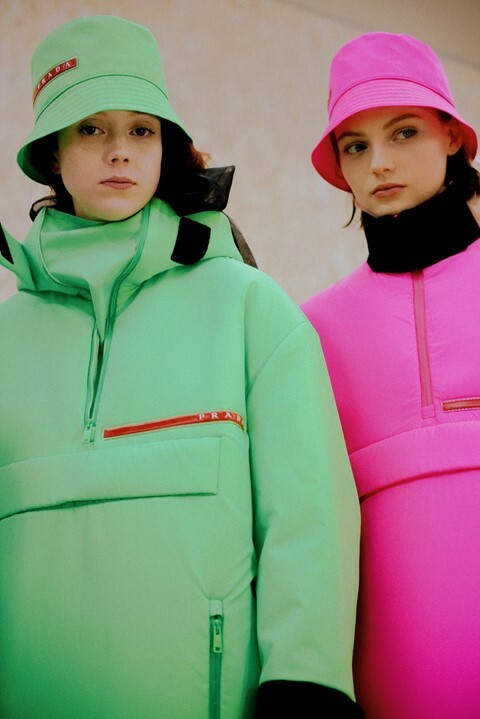 For AW18, Miuccia took it to the next level and sent her models down the runway in a series of wellies that wouldn’t look out of place on your local butcher. In a multitude of colours, the boots were finished with nylon (obvs – this is Prada) socks that ballooned out of the top. Elsewhere, accessories included sporty leather bags featuring chimpanzee and dinosaur silhouettes, sheer pop-socks and sandals, the name badges that were first seen at the menswear show in January and flame-heeled patent Mary-Janes. Wearing a bucket hat – just like some of the models were – Murray was just one of the unexpected people on the FROW, alongside Wes Anderson. You might remember that the actor started his own clothing line last year – maybe this was his way of taking some tips from one of the best?